The importance of this book cannot be understated as this was the tool that the earliest Spanish missionaries in the Philippines used to convert the local population to Christianity. It is considered among the earliest – if not the earliest – books ever published in the Philippines. Very few of the earliest Spanish publications in the Philippines survived the passing of time because these were printed mostly on flimsy materials that were vulnerable to the tropical climate. Most of the books that survived were those that were sent to Europe. Wikipedia credits the Franciscan friar Juan de Plasencia with the book’s authorship. However, Edwin Wolf’s suggestion was that the book’s author was unknown and that, instead, it was edited and corrected by priests of more than one order. The book was written in three ways: Spanish, Tagalog and the ancient script Philippine Baybayin.3 For the purposes of this article, we examine excerpts from the book that show usage of Tagalog that will be familiar to many who live in Batangas and neighbouring localities even in the present day. In reading these excerpts, bear in mind that the Spanish author(s) was(were) transcribing Tagalog words as he(they) heard them; i.e. spelled them as he(they) would his(their) native Spanish. They are a dying breed, admittedly; but proof, nonetheless, that traces of old Tagalog as the language was spoken at the dawn of the Spanish colonial era continued to be spoken in Batangas as recently as a generation or two ago. The use of the word “babaying,” adjective form of the noun “babayi,” is something that I do not even have to research for veracity as to usage in Batangas because I used to hear this a lot from the elderly, particularly when I was much younger. What I used to hear was more “babaye,” however, rather than “babayi.” But then again, the “i” and “e” sounds, among simple folks hereabouts, even to this day, are often interchanged liberally. Even to this day, the word “dini” or “dine” is still widely preferred by many Batangueños, and not just the elderly, instead of the “dito” of standard contemporary Tagalog. In fact, “dini” or “dine” is generally recognised as Batangas dialect, apparently having stayed around since the dawn of the Spanish colonial era. Whereas in standard Tagalog, “I am eating” is translated as “Kumakain ako,” in Batangas dialect, the same may be said as “Nakain ako.” Translated into English, the latter may sound odd to others because direct translation yields “I was eaten.” Similarly, “I am getting” in standard Tagalog is “Kumukuha ako.” In Batangas dialect, one might say “Nakuha ako” which is really more like “I was taken” when translated into English. The question going through my mind after painstakingly going through the Tagalog contents of Doctrina Christiana is this: Did the Tagalog language as we know it in the present day originate in Batangas and spread out to other provinces; or was Tagalog as it is still spoken in pocket communities in the province once more widely spoken, but for some heretofore unknown reason, Batangueños resisted its evolution to its modern form and held on for as long as they could to how the language was spoken at the dawn of the Spanish era? However, there is no real point in jumping to any conclusions. 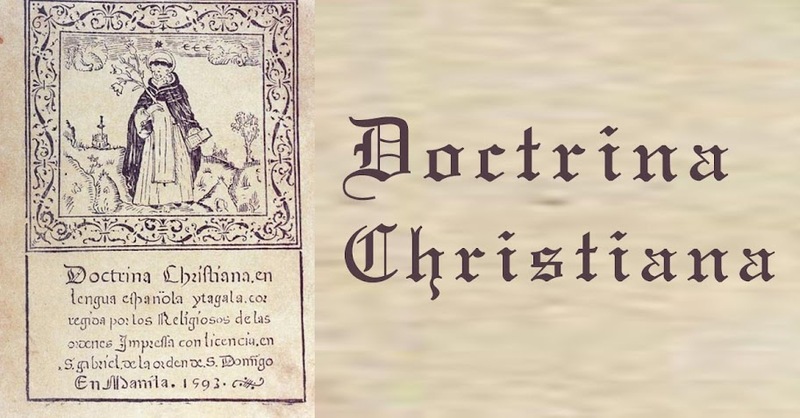 After all the laborious research just to establish the book’s authenticity, the hypothesis proposed by Wolf, who wrote an introductory essay to the Doctrina Christiana, was that it was co-authored by many friars. While this article has by and large tried to show from the Doctrina Christiana that Batangas has persisted with some elements of the Tagalog language as it used to be spoken at the dawn of the Spanish colonial era, it is also worth pointing out that the book betrays Tagalog’s kinship with Visayan languages. To my own personal knowledge, “dile” or “dilî” means “hindî” or “no” at least in Ilonggo and Cebuano; and likely in other Visayan languages. In fact, nowhere in the Doctrina Christiana was the word “hindî” or what sounds similar used. It is only now that I am discovering that “dile” was once a Tagalog word. While we are at it, “tawo” is also used in Cebuano. 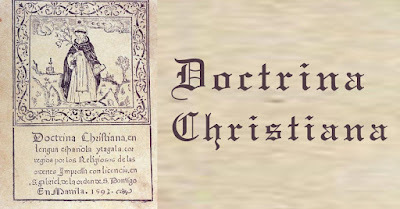 2 Doctrina Christiana The first book printed in the Philippines, Manila, 1593. A Facsimile of the copy in the Lessing J. Rosenwald Collection, Library, Edwin Wolf, Editor. 2005. If you like this post, please share it freely on social media. It helps to pay this site's domain name and maintenance costs.